How Do You Compare OpenNebula with OpenStack? Governance Model. The main difference between both projects is in their governance model, mainly for the definition of the architecture, the release cycle and the roadmap. While OpenStack is controlled by a Foundation driven by vendors, OpenNebula follows a centralized, "Benevolent Dictator" approach. OpenNebula is managed by a single organization that focuses on the interest of the project and strategically leads it to ensure that meets users needs. Why is OpenNebula following a "Benevolent Dictator" management model?. The above reasons are the foundation of this claim: OpenNebula is made for users by users, OpenStack is made for vendors by vendors. This may seem like a daring statement, but we have been following this path for years, and haven't observed anything that proves this wrong. On the other hand, OpenStack comprises many subprojects with different levels maturitythat require complex integration to achieve a functional cloud infrastructure. A growing number of components and subprojects is making even more difficult their integration and coordination, and the delivery of a single coherent solution. No update path is provided if you want to install a new version, and there is not commercial support. Any organization interested in using OpenStack, and requiring commercial support and enterprise maturity, is recommended (by the vendors running the project) to deploy any of the several enterprise distributions. 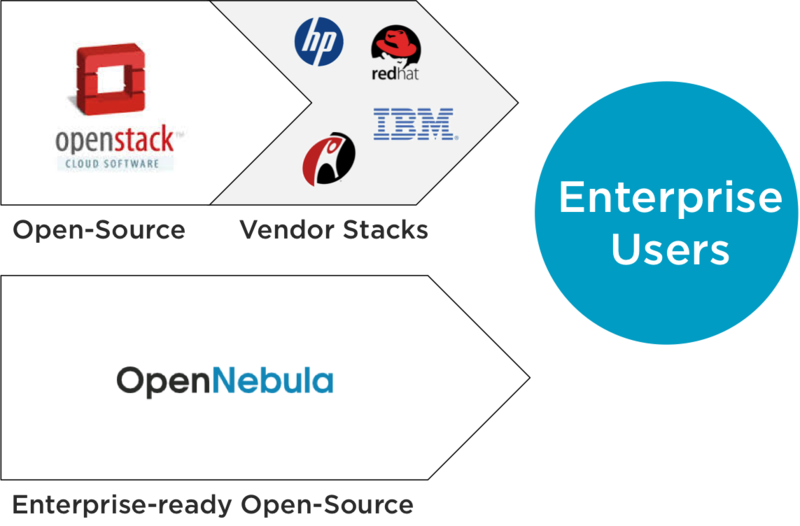 From a business perspective, OpenNebula does not compete with OpenStack but with the many existing vendor "stacks" based on OpenStack, mainly with those by HP, Red Hat and IBM. These enterprise-grade distributions incorporate different versions of the OpenStack components with extended features, custom enhancements and integrations that may erode their compatibility and interoperability. Moreover many of them include proprietary components and exhibit significant differences in the implementation of critical underlying functionality. We expect OpenStack to further fragment into more vendor specific "stacks" with narrow test matrices and extended proprietary features that lock customers in and don't interoperate well. OpenStack's biggest success is marketing. These vendor "stacks" and cloud providers will continue marketing "OpenStack" as the primary and, in most cases only, differentiator. However OpenStack penetration in the market is relatively small compared with the investment made by vendors and VCs. These vendor specific "stacks" are not only competing with OpenNebula, other open-source cloud management platforms like CloudStack and Eucalyptus, and proprietary incumbents, they are also competing between them and with the open source community itself. All vendors claim they are the OpenStack leader because it's a winner-take-all game. Only one of the OpenStack distributions will gain critical mass on public and private clouds. Red Hat, now the dominant contributor to OpenStack, is in our view the only plausible winner. Don't get us wrong, OpenStack is an open-source project with excellent developers, and some of its components are great from a technology point of view. Because a single cloud management platform can not be all things to all people, we will see an open-source cloud space with several offerings focused on different environments and/or industries. This will be the natural evolution, the same happened in other markets. 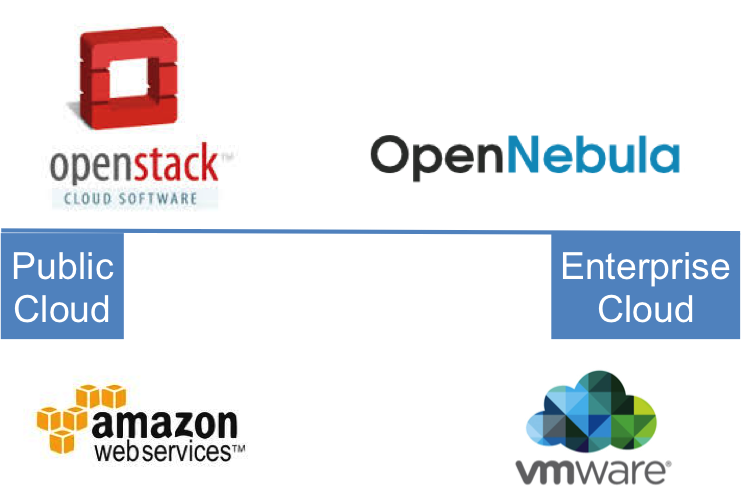 OpenNebula and OpenStack will coexist and, in some cases, work together in a broad open cloud ecosystem. In the meantime, we will continue with our focus on solving real user needs in innovative ways, and getting our users involved in a fully vendor-agnostic project.